These photos were taken on June 24, 2013 at 3:31pm. The location was on Route 495 near College Park, Maryland. The "Take It!" came to me as I was near the end of a long day much of which involves driving. I came up upon this truck with its very special cargo - and was completely taken with how much of a story there must be attached to this huge truck having only this child's bike as its only cargo. That the bike was out on the trailer by itself was one thing - but that it was prominently placed and in a fully supported upright position was quite something else. 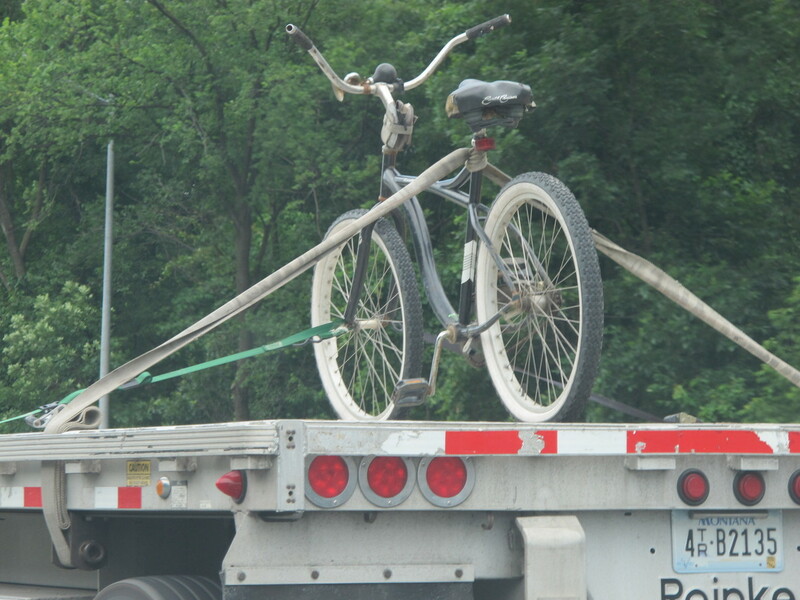 I doubt that the bike was for the driver, as was more probably being taken to a young fellow, as it is a boy's bike. Doing my best to avoid imagining the anticipation of its arrival by the intended recipient, I want to focus on what it did for me. I immediately got caught up in the fun of it all and completely forgot about my having spent a long day. When I went by the front of the truck I saw that it was an older model and had a radiator cover on it that was one of those Vietnam era MIA/POW profile poster looking things. I think this may have reflected the age of the owner or driver of the rig. As I went by the cab of the truck - I waved at the driver - who was seated far enough back that I could not see his face. The arm on the window sill, was tan. If the era of the symbol on the radiator was any indication of the age of the driver - it could well have been a Grandfather taking a gift to a Grandchild. The After Take: As I drove home. I could not help but hope the driver of the truck recieved many many more waves from other drivers who would be signaling their appreciation for what he had put together for some lucky child. I have shown these pictures to just a few people - and they all thought they were wonderful. I gave no coaching to anyone - just waited for their reactions. It was grand, to find the admiration for the driver was a shared response. Here is hoping you perchance upon something like this, if you are an observer, or better yet - one with a similar opportunity to produce such and unexpected delight - please drink it all in - for joy is what will be available for many. Oh such talent! Moving pictures are hard to master, great job! Talk about overkill! That is a good one though, can you imagine how imprtant that bike feels? 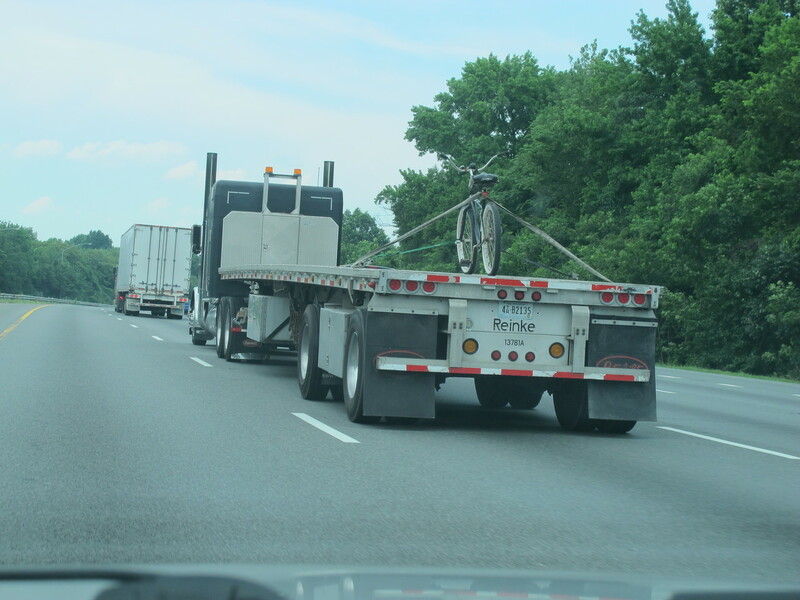 I can't imagine the circumstance that required him to transport that via semi. Lol Gabe. It does kind of give it a royalty affect. Fitting name for this story, love it!!! !